It comes as no surprise that Premium Illustrations are the go-to resource for professional designers. Creating design projects of any complexity won’t be an issue owing to 2000+ Premium Illustrations & 198 Fully Editable Typography Presets. What a perfect match! Grab the opportunity to purchase an exclusive set of hand-drawn vector illustrations and typography presets at a generous discount! 25 premium Illustrator vintage text styles + 5 new premium fonts with special characters come as a BONUS. What is more, the premium vectors come supplied with an extended royalty license. Once you’ve purchased the set, you are free to use them for your commercial projects without limit. If the bundle doesn’t meet your expectations, you have a 200% money-back guarantee keeping the source files! Don’t hesitate to purchase Premium Illustrations bundle to create eye-catching design projects in mere hours! 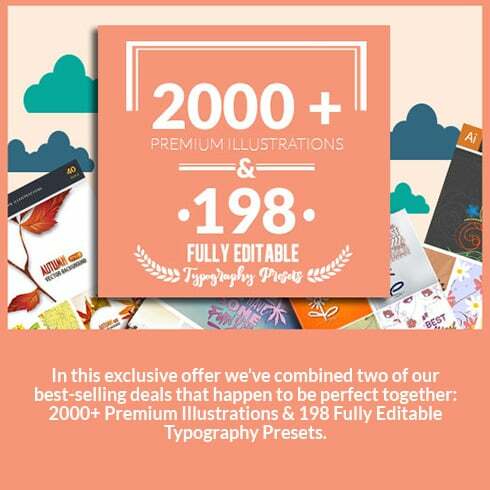 In this exclusive offer we’ve combined two of our best-selling deals that happen to be perfect together: 2000+ Premium Illustrations & 198 Fully Editable Typography Presets. This will become your go-to resource for creating amazing designs within minutes. Not to mention that for a limited time only you can grab it at a whopping 99% discount! You’re welcome! 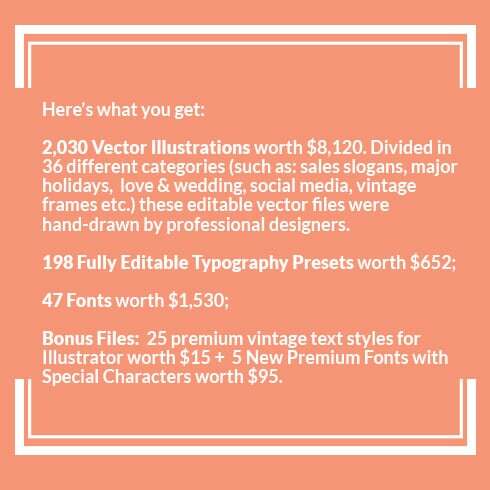 2,030 Vector Illustrations worth $8,120. Divided in 36 different categories (such as: sales slogans, major holidays, love & wedding, social media, vintage frames etc.) 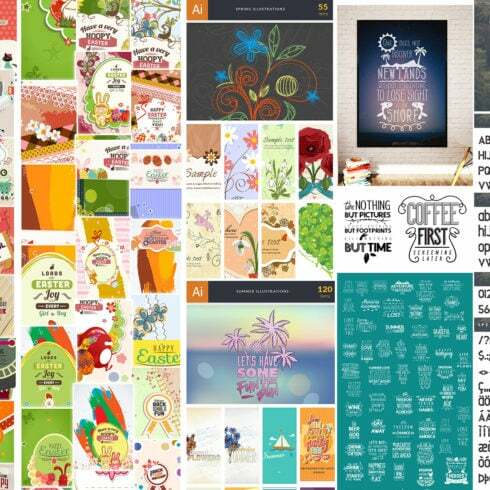 these editable vector files were hand-drawn by professional designers. Bonus Files: 25 premium vintage text styles for Illustrator worth $15 + 5 New Premium Fonts with Special Characters worth $95. Together with this deal we’re also offering a 200% money-back guarantee: if this offer doesn’t rise to your expectations, you will get your money back, AND keep the source files! Brainik Font Family: a Typeface You’ll Love – Just $9!